Map of Domed City in Abessa for Elex. Missions, NPCs, Quests, Teleporters, Trainers, Traders, Monsters, Items, Secrets, Hints, Locations ELEX Walkthrough, ELEX Maps, ELEX Guide & Wiki. 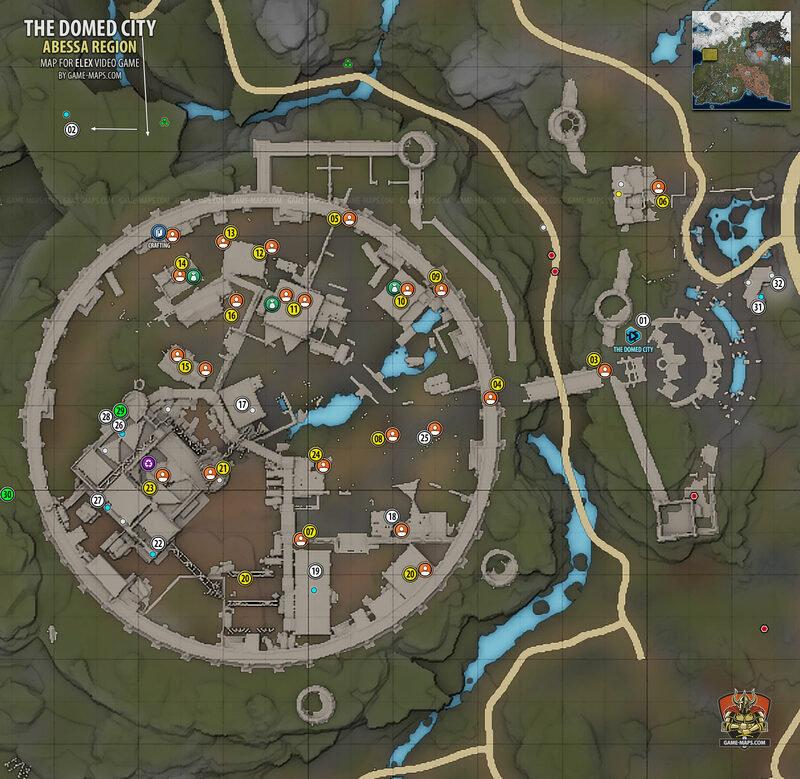 Domed City Map in Abessa for Elex. The first thing you should do when approaching The Domed City is to activate Teleporter. This is a particularly important Teleporter, as its activation activates the Teleporter in The Hort in Clerics land - Ignadon. This allows you immediately to get into the third faction area good low level exploration. At this point is better for you to visit Clerics than Domed City. So use Teleporter and go to The Hort. "the thieve's amulet is in the tower to the left of the domed city's entrance. very useful to be able to start pick pocketing at an early level"
Gregor guards the entrance to the Domed City. No one is being allowed into the city at the moment. He suggests that if I need trade, or safety should find a group who has set up camp nearby. Gregor does not want to let you in The Domed City. You have to find a way to get to the city. In Domed City there is competition between factions that will lead to a crisis. Albs attack is approaching, you should help Clerics and Berserkers to defend city. If you help Outlaws and Separatists, The Domed City will be destroyed and only a settlement will be left. You will need ID Card to get in. (better for me) You can talk with Gustav and get [Helping Hands] - to help Clerics. Killing Outlaws could be a little problem, but try it. Gustav wants to get rid of some Outlaws from the Domed City. Hunter can get me into the Domed City, but I will need to locate Wick, who has the Counterfeit ID cards he needs. Wick took the ID cards when he went looking for plunder in the ruins Northwest of Hunter's camp. I will have to find Wick to obtain an ID card, then Hunter can modify it for me. You can also betray Gustav and conspire with Hunter. Hunter suggested that I don't get involved in Gustav's power games. I should surrender him to the Outlaws. Gustav needs my help to get rid of some Outlaws. Outlaws have a preference for homemade, explosive weapons. They won't give them over willingly. If I can get one, Hunter will be grateful. Return to Gustav (05) for reward [Helping Hands]. Return to Gregor (04) and tell him that Outlaws who were trying to get into city are dead. Now you can enter The Domed City. The Domed City. The central city in Abessa. Erich wants me to deliver a replacement part for the Dome to his technician Lutz. It's a vital component needed to keep the Dome's shield running. After your talk to Erich for [Security Measures] you will meet Riley here. He will ask you for Energy Regulator, if you support Outlaws and Separatists you should give it to him. The Outlaw Riley knows I am supposed to deliver an energy regulator to a Cleric technician. He asked me to deliver his modified version instead so that he has a way of escaping the City if he needs it. If you support Clerics and Berserkers, you should not give it to him. Erich wants me to deliver an energy regulator to the technician Lutz. It's needed to maintain the shield. Return to Erich for reward. The Cleric Lutz is Worried about the lack of Comms with the Hort. Lutz tasked me with recalibrating the antenna at the relay station in the northeast. Lutz wants to reestablish contact with the Hort. He gave me the coordinates of a comms tower that needs to be recalibrated. There is trouble between the Outlaws and the Berserkers in the Domed City. If I chose to help one of the factions instead of the other, it could change the balance of power in Abessa. Brabak likes to humiliate Outlaws. He wants me to intimidate an Outlaw named Riley for him. You can return to Riley and apologize him. "Vito is very important NPC becouse he will give you access to The Claws, Guild of Thieves in Elex. See more info on How to join The Claws." The Outlaw Darrell told me that the Clerics are having trouble communicating with the Hort. He wants me to find out what they're planning to do to fix this problem and then to tell him their plans. Even you want to help Clerics go to Lutz and tal to him, he will give you next mission. Caja - she will be your Companion. Talk to her. Elex is everything. Everyone wants it. Everyone needs it. It has us all in its teeth. But, what is it? How has it come to control so much of our World? I used to simply accept these things, but now, now have questions. But, everything is different now. I can't be the only one asking these questions. There must be others who have already begun to wonder. People who are closer to the answers than l am. Caja is a powerful Berserker mage with an insight into the role Elex is playing on Magalan. Should convince her to join me. Caja is waiting on me at the Domed City in Abessa. I should look for her there. The Separatist Fenk claims that a Berserker is lying about the Separatists' intentions and is planning to frame them so that he can have all of the Separatists thrown out of the Domed City. Fenk wants me to convince Jorg to tell the Clerics that he Was accused unjustly. Caleb wants me to keep Jorg quiet so he doesn't tell anyone that he might have accused the Albs unjustly. This would mean the Alb Separatists would remain in the city. Tell Jork to stay silent - help Berserkers. Caleb's testimony will decide whether the Alb Separatists are thrown out of the city or not. "There's a king's Sorrel below #19 next to the old guard tower on the outside of the dome. Jetpack up to the small hill." Vivian needs capable technicians. She has three people in mind for the job: Rorik, Nyra and Darrell. I am to scrutinize these three and make a recommendation to her about which of them is best suited for the job. Rorik isn't sure he has the technical experience the Clerics need. Rorik has a real enthusiasm for technology, though there could be more experienced options than him. Rorik doesn't have a problem working with the Clerics. Rorik has had trouble taking orders from above. He isn't the best at reading and writing. Nyra will only work for the Clerics if she is paid in advance. Nyra has a high degree of technological knowledge. It's hard to imagine finding a better technical candidate than her in the Domed City. But there is the question of her loyalty. Nyra thinks the Clerics do good work but their logic is not flawless. She would rather see the city under the control of the Albs. I paid Nyra an advance. She is willing to work for the Clerics as a Technician. Darrell wants the job at any price and he's not afraid to say it. He is prepared to pay me handsomely if I tell Vivian to select him. Darrell doesn't know anything about technology, but he claims to be a quick learner. Darrell made it clear he considers the job a way to get closer to them. He and the other Outlaws are afraid of what the Clerics are planning. "Number 20 (from right side) on this map: there is a chest with Mechanic Cap (armor) in the building where you can find Vivian and Cleanbot. There is also one copy of Propaganda." Gottfried is forgetful and hopes I can help jog his memory. The Outlaws in the Domed City want to be supplied with Weapons. Do I back them or the Clerics? Alois wants me to take the weapons delivery to him instead of Paige. He wants me to take the weapons out of circulation So as to guarantee peace. Paige wants me to meet her contact outside the Dome and collect a weapons shipment. Paige is being watched, there are people who want to stop this deal going through. Help Paige and take weapons to her to help Outlaws. He is not here from the beginning, he will appear at some point. He will ask for help. Give him money, he promises that in a few days he will have info for you. After you calibrate Comm Tower. Gottfried was finally able to establish comms with the Clerics in the Hort. The Clerics in Ignadon need more Elex to complete the mech delivery that the Domed City requires. Gottfried asked me to take the Elex to a rendezvous point where will meet a group of Clerics from Ignadon. Fly down the cliff and land on the shelf, enterance to the cave.